Attached to the main house, but completely separate is a self contained studio flat. It has a bathroom with shower, minor cooking facilities, TV, and a Queen bed with outstanding views to Snelling Beach. Listed as one of Australia's top 101 beaches. 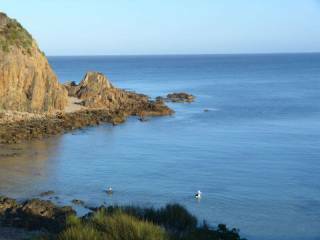 * Beautiful unspoilt beaches, diving, swimming, snorkelling, fishing. (Pictures are images of the Studio, as well as images of the coast between, and including, Snelling Beach and King George Beach). 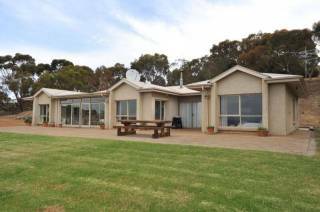 * Abundant wildlife, such as koalas, wallabies, kangaroos, echidnas; native birds such as kookaburras, wedge tail eagles, miniature blue wrens; farm animals grazing on the hillsides. Now available for minimum 3 day short lets by negotiation with the owner, as we now live in a smaller property 4Km away - or minimum 6 month fully furnished long term let. We are willing to negotiate a lease for good tenants and welcome discussion for long term rates. Our general price guide $150.00 for flat which sleeps 2. Snelling Beach/Middle River is fast becoming a sought after destination for vacationers, but retains its peace and tranquility. So, relax, rejuvenate and explore. Kangaroo Island is accessed by air from Adelaide to Kingscote - 20 minute flight, followed by a 45 minute drive to the property or by car ferry from Cape Jervis to to Penneshaw.